mikeghouse October 2, 2016 October 2, 2016 Comments Off on Does Atheism Matter? We all have a choice to believe that there is someone called God who created us intentionally or there is no such thing as God. While a majority of humanity believes in an active God of the universe, nearly 10% of the humanity does not believe that there is something called God which consciously directs every aspect of life. What we believe is indeed our inalienable right. It would be sheer arrogance to believe that Atheists are wrong, they may be wrong to you, but not to them. It is time we learn to respect the otherness of others and accept the uniqueness of each one of us on this planet, if we do that, conflicts fade and solutions emerge. By the end of 2020, there will not be a major city in America, and perhaps in the world, where you will not find people of different faiths, cultures, ethnicities, races, nationalities and social backgrounds working, eating, playing, marrying, and doing things together. We need to prepare ourselves for those eventualities to prevent possible conflicts, and lay a good foundation for nurturing goodwill and effective functioning of the societies. Exclusive communities will become a thing of the past. If you live amidst others, you must also respect the otherness of others, as you expect them to do the same for you. Our goal is to bring people of different faiths together and provide a platform for them to share about their beliefs, their systems and rituals, while expanding the knowledge zone of each group. Details at: www.CenterforPluralism.com/Workshops The Center for Pluralism is committed to promoting understanding between peoples of different religious, social, political and national affiliations. 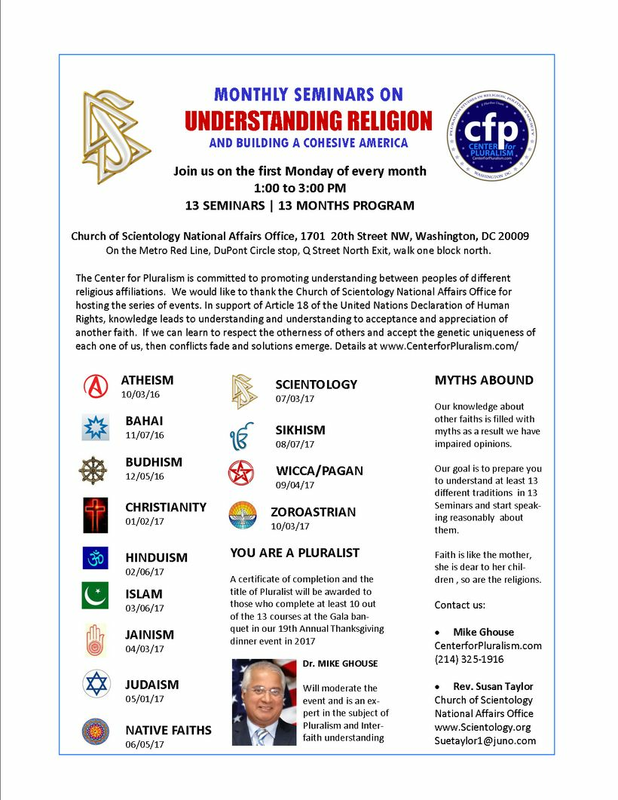 We would like to thank the Church of Scientology National Affairs Office for hosting the series of events. In support of Article 18 of the United Nations Declaration of Human Rights, knowledge leads to understanding and understanding to acceptance and appreciation of another faith. If we can learn to respect the otherness of others and accept the genetic uniqueness of each one of us, then conflicts fade and solutions emerge. Back in the 70’s, I followed Dr. Abraham Kovoor, the father of Modern Atheism. I understood his logical explanations about nature and creation. Being an Atheist was acceptable in India, when I came to the United States, I was completely taken back by the way people looked down at you when you claimed to be an Atheist. Thank God, that is not the case now. I was an active participating member of the community in Dallas. I used to publish a news paper where we wrote about every religion. In 1996, I launched a radio show and dedicated 15 minutes each week to the festivals of each faith. Someone prodded me to join the Thanksgiving Square in Dallas, which was a vibrant community center in Dallas. My app was rejected as they did not have a pigeon hole for an Atheist; I was told I could join if I were a Hindu, Muslim, Buddhist or the other. Instead, I chose to organize the Center for Pluralism (at that time it was Foundation for Pluralism) to include every human. The Irony is funny – back in 2005 we initiated the Unity Day USA event that continues today as an annual event. My goal was to include everyone in the event and I was a part of every religious group but Atheists (I chose to become a Muslim in the late 90’s), so I joined an Atheist group with the express purpose of keeping in touch and inviting them to the Unity Day and other events. Guess what happened? A week later, I got an email asking me if I believed in God, which I answered in affirmative. They kicked me out of the membership. What a world! In 2003-2004, I had a Radio show called “Wisdom of Religion.” It was a daily morning show between 6 AM and 7 AM. Each week we did a program on Christianity, Islam and Hinduism and each alternate week it was Baha’i, Buddhism, Jainism, Judaism, Sikhism, Zoroastrianism, Interfaith and Atheism and other traditions. Atheism was one of the most popular shows; there was the curiosity among people to know more about it. Why don’t you learn about my religion? You have heard this before, “Why don’t you learn about my religion?” As if the problem will disappear if you learn about his or her religion. In reality most of us are loaded with myths and misinformation about the other traditions. Indeed, if we learn about others, we tend to purge our own biases towards others and start living our lives and let others live theirs. Muslim are not the only who believe, Islam is misunderstood. Hindus also believe their tradition is misunderstood. Indeed, Atheism is one of the most misunderstood traditions from the very beginning of humankind. We all have a choice to believe that there is someone called God who created us intentionally, and there are those who don’t believe that there is a thing called God. If you discount Atheism, you give legitimacy to others’ discounting your own faith. 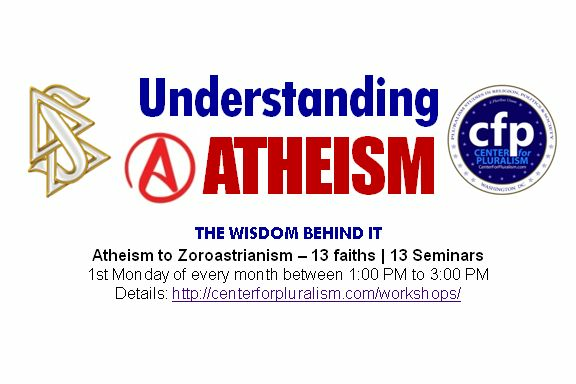 You are so right about it, and here is your chance of doing precisely that; to understand 13 other faith traditions in a series of seminars over 13 months. We will follow the Alphabetical sequence fro Atheism to Zoroastrianism and every faith in between. By learning about other faiths, the strength of your faith multiplies while giving full respect to others. It is like Bill Gate’s attitude, the more people he made millionaires the greater a billionaire he became, likewise the more faiths your respect, your own faith strengthens. You have to ask the people who have a strong faith; they never denigrate others’ faith. Let me be blunt, if you do not give full value to other faiths, it is more than likely that you do not value your own faith. You miss out on the joy of full faith that comes without dismissing others. Muslims and Atheism Today, I have a strong faith in Islam based on respect for other traditions committed to building cohesive societies. Learning about other faiths does not weaken your faith, but rather it strengthens knowing that other faiths are equally committed to building peaceful societies. We hope each one of us would walk in with an open mind and an open heart towards understanding other faiths, and walk out feeling connected with our fellow beings who are different than us. No matter what faith we believe, we have to live together, and as responsible citizens we have to create an environment for each one of us to live without apprehension. Do You Choose Your Friends by Religion?